I was looking forward to this trip because I was going to be able to shoot football (both kinds) for the first time in 40 years. Yes, 40 years. In college I shot football from the sidelines fairly regularly, but as my career took me other places I mostly gave up sports shooting and, in particular, football. The cameras I used on this trip were the Canon 7D Mark II, the Sony A7r Mark II, the Nikon D4, and the Nikon D810. Yes, two of those aren’t what you think of as sports cameras (A7rII, D810). Three of the four cameras aren’t what you’d normally consider for very low light work (all of the games I shot were outdoors at night). So you’d expect me to have some troubles, right? 40 years of not shooting the sport and a challenging set of cameras should do me in. Let’s see how it went. Let’s start with the Canon 7DII. Yep, it’s amazingly like a 1Dx in terms of form and function, only it uses a crop sensor. Because of the sensor size, you might expect it to be less low-light capable. My first assignment was the Maryville versus Dobyn’s-Bennett high school football game. Maryville is a powerhouse and many-time state champion in Tennessee, and undefeated so far this year. Oh, did I mention this was a night game with a strong chance of rain? The Maryville field is lit by only four very flickering light sets, two on each side of the field. 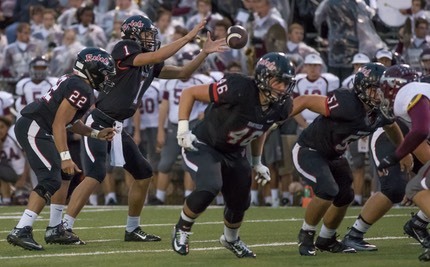 The Maryville team often wears black uniforms, the end zones are painted black, and there are a lot of light blockers at both ends of the end zones. Coupled with rain showers at the start of the game and a fully covered night sky, I can’t think of a better prescription for High ISO Testing ;~). I was shooting the 7DII at ISO 6400 to 8000 during the game, mostly at 8000 once I decided that I couldn’t keep the shutter speeds up high enough on the low-end of the light flicker (even with the 7DII’s flicker detection enabled—which hobbles frame rate a bit—I could still see image-to-image exposure differences during practice). At the front of the 7DII I mounted the Canon 70-200mm f/2.8. I decided on the shorter focal length range as I had quite good access to the sidelines and could stay close to the action. While I was worried that ISO 8000 would really be pushing the crop sensor, as it turns out just a bit of judicious noise reduction was all that was necessary to turn in publishable shots. The primary problem I see with the 7DII at these extreme ISO values is that it tends to block up colors and it’s tough to pull additional detail out of the deep shadows. After some early fretting over settings and performance, verified with a bit of excess sideline chimping on my part, I felt quite comfortable shooting with the 7DII. For the most part, it just felt and operated like a slightly smaller 1Dx, and tracked focus pretty much like I’ve experienced with the 1Dx in the past. One of the attributes of a good focus system is how it responds to rapidly changing conditions and instructions. I went from following a slower moving player to snapping my body around virtually instantaneously to faster action happening at a different distance to me. In the three-shot sequence of the touchdown catch, the first frame is ever so slightly front focused, while with the last two the focus system caught up to me. And yes, I moved the focus sensor position in all of this with the thumb pad. Overall, the focus system of the 7DII felt pretty much like I’ve encountered using the 1Dx. Nice. Which brings me to a point about cropping. I could crop the previous frame to just the receiver catching the ball and have a very usable image for print. Indeed, that’s often what you’d see in a newspaper or magazine about the game. Here I’ve left the Dobyn’s-Bennett cornerback in the image for a couple of reasons. First, including him clearly shows us the goal line, whereas excluding him and cropping tight doesn’t. Second, it shows how clearly he got beat on the play. The question of what to include or exclude has a lot to do with whether you’re trying to illustrate what happened in the game, or whether you’re trying to illustrate a player making a great play. I chose the former here, but there are plenty of pixels to be able to crop to the latter. The first thirteen shots are very nicely focused. However, the last few aren’t, mainly because the play came straight at me and I ended up pretty much just framing the ball at 200mm ;~). In other words, I passed closest focus capability of the lens. Overall, I was impressed with the 7DII. It survived a rain storm at the start of the game, it handled and shot just like a mini-1Dx, and even at ISO 8000 it produced very usable images. (That last shot is ISO 8000, 1/1000, f/2.8 at 200mm, by the way.) I can’t overemphasize how dark this venue was. Back in the film era we simply wouldn’t have been able to shoot these images. Pity that Nikon hasn’t thought to produce a D400 with similar attributes. The next night I shot a different type of football, this time with a Sony A7r Mark II and a Nikon D4. I had the Sony 70-200mm f/4 on the A7rII, and my 400mm f/2.8 on the Nikon. The real problem I then had with the Sony was simple: timing. No, not focus, as you should be able to tell from these shots. For those of you wondering, my focus settings were: Focus Mode AF-C, Area Mode Wide, Drive Speed Fast, Track Sens High, AF illumination off, Center Lock-on enabled, Face detection DISABLED, Pre-focus enabled. I experimented with a number of other combinations of settings, but in general found those that I just mentioned to work fine as long as I was getting the subject on the detection area. Okay, you need a definition of “fine.” Fine means that I was getting some (many) in-focus shots. However, in examining sequences, I see very few sequences where focus held perfectly on the subject. Also, the camera had a strong tendency to move to back focus if my subject didn’t completely cover the focus sensor area being used. Yes, I could have changed off of “wide,” but I found that this actually exacerbated the problem when the action was fast and I wasn’t perfectly tracking the subject. In soccer, there’s a lot of non-linear movement as the players stop and change direction. Having shot practice (and a half-time match with youth players), I’m pretty confident that I ended up with the best possible settings for the circumstances. Whether those would be the best for daylight or other sports I don’t know yet. That said, if I had to use the A7rII as a sports camera, I think I could adjust my personal anticipation marker a bit and get more peak action shots. I’d probably give up on shooting bursts and try to adjust my shutter release timing to click a little earlier in anticipation of peak action. Overall, I was impressed at how well the A7rII was doing under the very trying circumstances. With 42mp to crop from, reasonable noise handling, and fairly predictable focus performance, if someone told me I had to cover a game with the A7rII, I wouldn’t throw up my hands in complaint and protest by burning my NPPA badge. The A7rII certainly wouldn’t be my first choice, though, and by a fair margin. Still, it shows that the mirrorless bodies are starting to sneak into the fringes of DSLR performance realms. I was also using the D4 with the 400mm f/2.8 at the soccer game as my primary camera. How’d it do? Great, as you’d expect. No problems following action and getting sequences in focus. No problems with timing. Here are two images from the sequence where the only goal was scored (by Tennessee). What’s that mark on #37’s leg, dirt? With the right lens and right position, 16mp is plenty enough pixels, especially for the types of uses these images would tend to have. 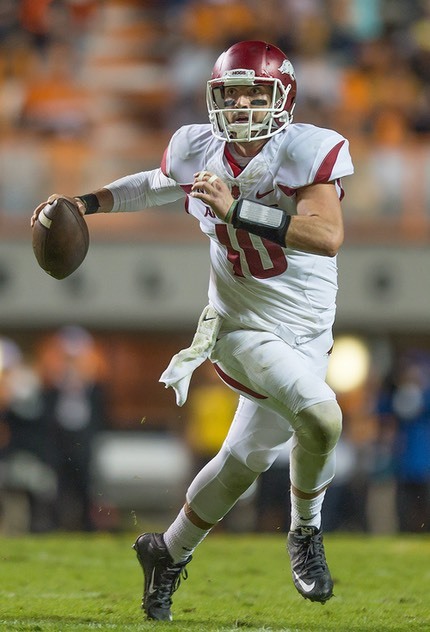 I had originally brought the A7rII along to use as a second camera with a wider lens at the primary event I was covering, the Tennessee versus Arkansas football game on Saturday night. I was going to use it to supplement my usual primary camera on the sidelines, again the D4 with the 400mm f/2.8. But after getting a good feeling for how the A7rII handled at the soccer match the previous night and with a high prediction of rain, I decided to pull out my D810 and see how it fared instead. Not exactly an apples versus apples test, but in both cases I was looking at a high-megapixel, slow frame rate body just for those times when the action got close to me. So let’s proceed to the main game. As with all three games, it was a night game and it began by raining during warmups and a bit into the game. You always want to try to catch the key players in isolation with classic positions or moves. If you’re trying to improve your action photography, note one thing about so many of these images I’m showing: no leg plants. People are in the air, heels are lifted, legs are extended. You’re trying to imply motion, and any leg that comes down to the ground—and especially ones that end with a foot flat to the ground—does the opposite. This is true of wildlife, too, which is one reason why I dabble in sports from time to time. It’s a heck of lot cheaper going to a football game than Africa to practice. Likewise, you want to see the eyes. With stadium lighting at night you’re going to get shadows down into the helmets to start with (a bit of Shadows processing in Adobe converters helps with this), but the lower you go, the better off you are. Note that almost all my shots are looking up at the players, trying to get that elusive face. That meant that I was on my knees the whole game, but I had brought knee pads in anticipation of that. Tennessee was going to get the ball first. Rather than go down to their end of the field I decided that I’d gamble on sitting down at the end zone they were headed towards and finding me a good spot should they manage to move the ball. My reasoning went a bit like this: there was a huge crowd of photographers and videographers on the sidelines, along with the ESPN TV coverage team, and I figured I’d have an easier time of getting a position and holding it than trying to find one in the crowd. If Tennessee moved the ball, or had a breakout play, I’d be in position. If they didn’t, I had nothing. It’s a gamble, but a calculated one, as you’ll see. You guessed it: the first kick was run back the entire length of the field for a touchdown. Here’s another shot in the sequence with the head coach (far left). Now I mentioned above that 16mp is enough. Where’d this next shot come from? You guessed it, it’s a crop just on the coaching staff taken from one of the shots I took in the run-back sequence. I’ve got plenty of pixels to run in a newspaper or magazine. Plenty. But let’s keep going. Here’s our runner a little further up the field in the same sequence. I actually don’t mind that camera has technically jumped to the sidelines for focus. First, that’s where the story is getting told to the viewer (Touchdown!). Second, I’m far enough away—other side of the field—so that my depth of field is enough to actually keep the runner in acceptable focus. Okay, you want calculations. Full frame, 400mm, f/2.8, width of the football field is 54 yards wide (about the same in meters). I’m a few yards back from the line, and the player in these shots is 30-40 yards ahead, so I’m easily 60 yards away, probably more. My DOF calculator tells me that I’ve got a DOF of at least five feet. And yes, I knew that going in. I was actually considering switching to f/4, which would increase my DOF to at least eight feet, but didn’t. Yeah, refs get in the way from time to time. But notice that his feet are off the ground ;~). Okay, so what did we learn from that little sequence? Be prepared, you never know what’s coming your way. But there’s a bit of a sub-story. During warmups, I had noticed something really weird: the Arkansas kick-off returner kept misjudging even the practice punts he was fielding. They kept hitting his helmut (coach: check his eyesight!). Sure enough, guess what play is coming next after that touchdown? A kickoff to Arkansas right down where I’m kneeling. And what do I think is going to happen after seeing him misjudge those kicks in practice? Yep, he’s still misjudging catching the ball. I wish I were a bit forward of my position here, as his eyes are looking straight up at the ball. All of these shots—the touchdown runback and the fielding of the ball on the helmut—were informed by the same thing: scouting. Tennessee had run back a couple of kickoffs for touchdowns in the previous two games. Even though I couldn’t count on that happening, I was ready for it. Had I been at the other end trying to get ready for the first set of plays from scrimmage, I would have been behind the touchdown run and captured it with nothing but player’s backs or best case sides. Any one of those probably could have run with a story about the game. Every one has players eyes visible. Not great. But I saw Hurd (#1) completely break through that pile behind #5 and just adjusted. It’s in sequences like these that you really need high frame rates and great focus performance. So you’re probably wondering how that D810 did versus the Sony A7rII, right? Ouch. The D810’s cranking along at 5 fps doing just fine, right up to that final shot, where for reasons I’m not totally sure of it has flipped focus to the background. Ugh, ugh, ugh. In looking at the image between these last two, focus is already being lost, even though the focus sensor is on the arm of #2 and the ball. It’s probable that the focus system lost contrast as I was zooming, though I don’t see why it should in examining the evidence. When that happens on Nikon bodies, the cameras tend to be very quick to rock focus back, even though my Focus Tracking with Lock-On value here was set to 4 (long). In theory, the focus should at worst case be on the helmut of the guy on the ground, as that’s where it was prior to losing focus. I’ve noticed this before: the Nikon’s have a slightly more skittish sense of focus than the Canon’s. Neither is perfect. Sometimes I find the Canon trying to hold focus in the wrong spot for too long, sometimes I find that the Nikon jumps off of focus too quickly, as it did here. Both camera makers give you some tools to adjust that, but as you might note, I had already set an adjustment telling my Nikon to be less skittish. I’m going to have to experiment with this situation some more, but I suspect that my zooming was impacting the focusing. The good news is that I’ve got six images of the touchdown that are publishable, but just didn’t get that last bit of ball extension. By the way, two images after this last one is nothing but green grass, as I ducked just in case Dobb's momentum got him all the way to my position. Overall, I enjoyed my extended weekend shooting football. Indeed, I’d love to be doing more of this, as it’s definitely good practice for wildlife shooting. So if any of you can get me sideline access to college or pro sports in the Northeast, let me know. I just might show up with a SUV-full of gear.